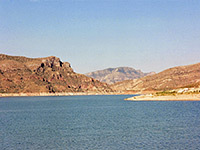 San Carlos is one of eight lakes with desert surroundings created by damming rivers in the hills around Phoenix, and like the others it has quite a dramatic setting with the deep blue waters framed by gaunt, rocky, cactus-speckled mountains - in this case, the foothills of the Gila, Mescal and Santa Teresa ranges. The lake was formed by the Coolidge Dam (named after the twentyninth president) on the Gila River - the largest in south Arizona, this has its source in the Mogollon Mountains of west central New Mexico and once over the state border flows through a wide valley for over 80 miles. It then enters a much deeper canyon through the Mescal Mountains, the penultimate series of hills before the deserts of the southwest begin, hence the mouth of this ravine was selected as the site of the dam, which was completed in 1930. 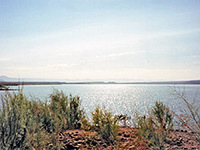 San Carlos Lake lies within the 3,000 square mile San Carlos Apache Indian Reservation, the second largest in the state (after the Navajo) and so is subject to tribal regulations - a permit is required for all hiking, fishing, camping and off-highway driving. It is close to US 70, a main route between Phoenix and Lordsburg, NM, and is reached by IR 3 which loops around the south side, over the dam then north towards the capital town of San Carlos. Much of the land bordering the north and east shores is dusty, featureless and rather flat - gently undulating mounds with palo verde trees, assorted bushes and scattered, often somewhat unhealthy-looking saguaro, amongst which run numerous dry sandy washes. Many dirt tracks criss-cross the arid landscape, leading eventually to beaches and promontories right next to the shoreline - nice places to camp or spend a hot summers day by the water. The beaches are mostly stony, some with an interesting mixture of multi-colored pebbles but some have sand, the gradient is often quite gentle and the water is warm. The one drawback seems to be the amount of litter - often a problem with sites nearer Phoenix with easier access such as Lake Pleasant and Saguaro Lake this is unfortunately also often associated with the Indian Reservations. The nearest towns with hotels close to San Carlos Lake are San Carlos to the east and Globe to the west - follow the links for hotel descriptions and reservations.